As a professional pet sitting and dog walking company, we’ve heard and seen it all. People’s houses – particularly new pet owners, can be a haven for things that can poison your pets! March is the month set aside for education regarding poison prevention. This is a great time to review common, household items that are poisonous to animals. Human Medication. Have a counter surfing dog or cat? Keep meds tucked safely away in a counter. Accidentally drop meds on the floor? Make sure you dog knows the “Give” command. Having dogs immediately drop and spit out things they shouldn’t have in their mouths is invaluable and potentially life-saving! Insecticides. Fighting the battle of the bug? Make sure the products you use are pet-safe. Check with your vet to make sure you’re using the correct flea and tick topical ointments – mistakes can be costly! Rodenticides. Trying to kill that pesky rodent? Make sure you don’t accidentally kill your pet! 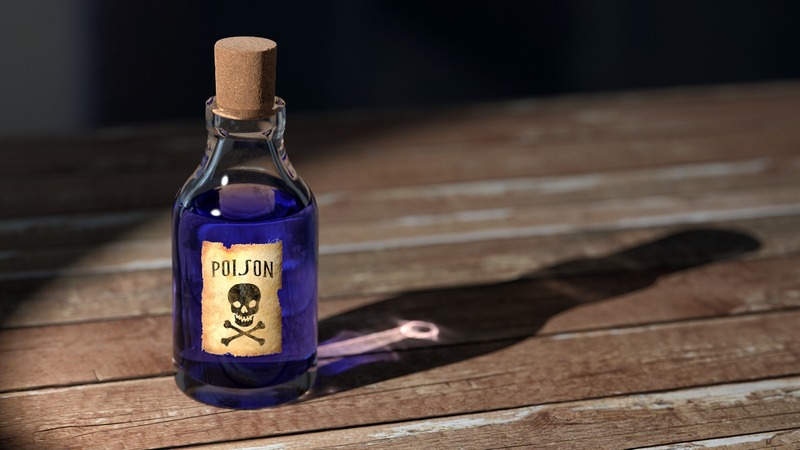 Keep these highly lethal chemicals well away from your pets or don’t use them at all. Remember, if you kill a mouse, your dog or cat could ingest the mouse and be poisoned by secondary ingestion. Human Food. Chocolate, avocado, grapes, raisins, onions, garlic, etc. People food can be deadly. Grapes and raisins can cause canine kidney failure. Other foods such as onions and garlic can cause anemia. Did you know chocolate can kill your pet? Did you know all dogs are allergic to dairy? Best policy…don’t give your pets any human food unless you know for certain it will not cause harm! Animal Meds. Keep all animal meds off countertops and safely in cabinets out of your pets reach. Household Toxins. Keep all cleaning products and other items like batteries safely away from pets. Have scented candles that smell like home baked cookies? Bad idea. Keep all room fresheners safely away from your pets. Plants. Look up an know which indoor and outdoor plants are poisonous to your pets and learn how to identify them and avoid them. This includes such common plants as lilies, sago palms, poinsettias, oleander, and others. Herbicides. Animals love salt and many herbicides have a salty taste. If you have to use herbicides in your yard, make sure they are pet friendly, read the labels, and keep you pets away from the treated areas until they are dry and/or safe. Outdoor Toxins. Ice melts, fertilizers, antifreeze, etc. are all tempting to your pets and highly lethal. Keep these out of reach of you pets! Help your pet sitting company keep your animals safe while you’re out of town. Do a once over of your home and yard prior to taking off. Post the APCCA’s 24-hour hotline number on your fridge so your family and pet sitter have quick access: (888) 426-4435.